Join us this summer, Monday, June 24 – Thursday, June 27 in San Antonio, Texas for the ACE Annual Meeting. ACE develops the professional skills of education, government and research communicators, and information technologists to extend knowledge about agriculture, natural resources, and life and human sciences to people worldwide. We are a vibrant, international association of communicators, educators and information technologists. The independent, non–profit organization offers professional development and networking for individuals who extend knowledge about agriculture, natural resources, and life and human sciences. 1. Learning Communities. Network with professionals with similar interests and participate in professional development opportunities. Learning Communities communicate through electronic discussions and listservs, as well as during meetings at the ACE annual conference. 2. Annual ACE Conference. Join more than 250 communications and marketing professionals for four days of networking, learning, and fun! Members receive discounted registration fees. 3. 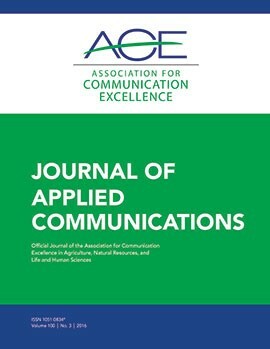 Journal of Applied Communications. JAC is a quarterly, peer-reviewed, professional online journal. 4. ACE Critique and Awards program. Receive recognition for your professional work and service. There are categories for everything from magazines and videos, to feature story writing and photography. 5. Professional Development. Opportunities are offered by the Learning Communities, as webinars and at the annual conference. Share your expertise by presenting through one of these venues. 6. Leadership opportunities. The ACE Board, learning communities, and committees offer opportunities to apply and expand your leadership skills while shaping the programs, services, and future of our organization. 7. Social Connection. ACE is on Facebook, LinkedIn and YouTube. Many of the Learning Communities have social media sites, too. 8. Job Postings. ACE provides access to job postings for career opportunities. knowledge about agriculture, natural resources and life & human sciences.